This underground heating pipe was drilled through by contractors and repaired using SylWrap Under Pressure Kit Contractors accidentally drilled through this buried cold water return pipe when they used a hole saw to cut through what they believed to be a drainage pipe. The drainage pipe actually contained two insulation lagged pipes running under a paved farmyard from an outbuilding, which supplied hot water to the main building. It looked like the repair would be difficult and expensive, involving digging out the pipe and cutting away the outer pipe and lagging. Fortunately, using a SylWrap Under Pressure Pipe Repair Kit meant that a minimal amount of lagging needed to be removed. 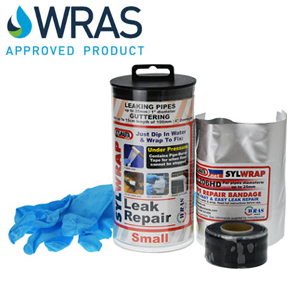 The leak was easily sealed using Wrap & Seal Pipe Burst Tape before finishing with a SylWrap bandage, make the repair permanent and long lasting.